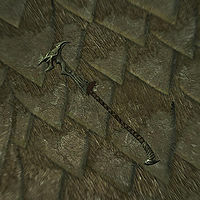 Rahd can be found next to his signature weapon, having been killed by Falmer as a grisly sacrifice. The weapon can safely be removed from his dead grip, and should as it serves as the primary reward for the related quest. While Rahd was living, the weapon also served as his nickname, as evidenced by a bandit chief calling out to him: "Hey, Longhammer, set us up with a round of... what in Oblivion happened in here?" This is the fastest two-handed weapon in the game which is not an artifact (the Ebony Blade is the only faster two-handed weapon, and none even equal it outside of mods or the Creation Club). The Longhammer is affected by the Elemental Fury shout, allowing even faster swings.